Elegant, expansive and available a just outside your door. 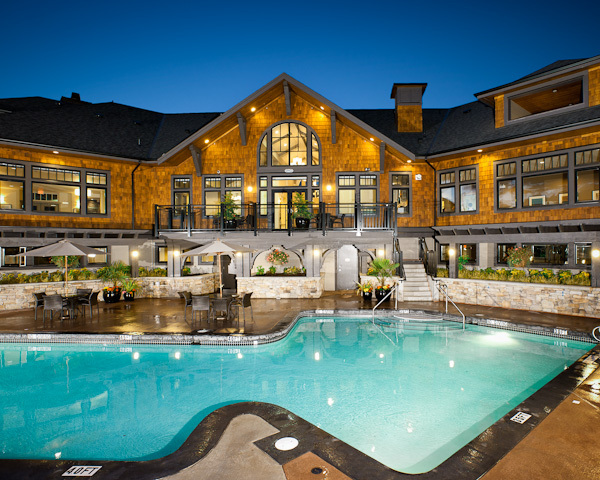 The Sunstone Clubhouse is a three storey, 12,000 sq foot building in the heart of Sunstone. The main floor boasts cathedral-like ceilings, a meeting room featuring a lovely stone fireplace, television and pool table, and a socially-centered lounge area with couches, chairs and tables. A kitchen with fridge, stove, dishwasher and microwave is also included. An expansive patio off the meeting room provides views of the playground, pond, trails, outdoor pool and hot tub. There is a games room with a choice of ping pong, foosball or shuffleboard, and next door to the games room is an indoor basketball court. Downstairs there’s a party room with lots of seating, a theatre, and a fully-stocked fitness studio with exercise equipment. Activities are offered at Sunstone Community Clubhouse, including Yoga and dance classes for all ages. The top floor offers guest suites for rent to family and friends. Laundry facilities are also available. There is elevator access to all three floors. Clearly Sunstone Clubhouse is a fabulous and convenient facility, available to all townhouse residents in the community of Sunstone. An expansive patio off the meeting room provides views of the playground, pond, trails, outdoor pool and hot tub.